Our regular United Parcel Service Ground delivery gets product anywhere in the lower 48 states and the ten Canadian provinces between 1 and 6 business days. We also offer a 2 day Expedited service. Because our products are high quality and made of steel, the average weight of each package is 13lbs. In fact, we often ship packages that weigh in excess of 60lbs. As a result, we base our shipping fees on the value of your purchase which in turn corresponds to a known range of weight. Your shipping charge reflects the costs for that particular weight. 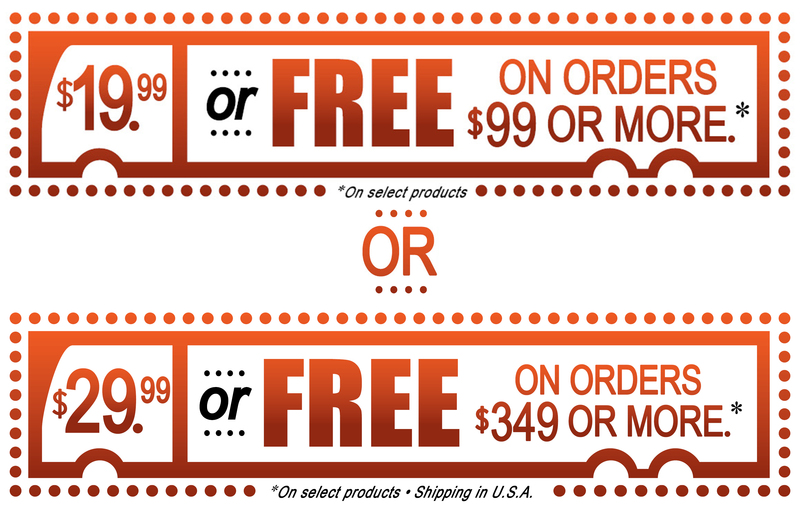 Look for the Shipping icon on each product page which will tell you the flat rate and the order value when FREE shipping applies. We have two shipping categories: light or heavy. Lighter products ship for "$19.99 or FREE" when $99 or more. Heavier products ship for "$29.99 or FREE" when $349 or more. We do offer UPS and Postal Service (Air) for international shipping. If you have further questions about our international shipping please contact us for a quote. We do not deliver to US post office boxes or US military APO/FPO Addresses. We require a physical address for UPS to deliver to. We are not responsible if you choose to ship your order via UPS to a USPS PO Box or military APO/FPO address and your order is returned to us as undeliverable. An additional fee will be charged to reship your goods to a deliverable street address. If you choose to cancel your order after an instance of non-delivery, we will deduct the original shipping fee from your refund. We reserve the right to change the terms of or discontinue this offer at any time. We have no control over our shipping partners, their operations, or events that affect their delivery schedules. We therefore do not guarantee on-time delivery. We offer daily shipping to all US (lower 48) states using UPS Ground service. We also can offer a 2 or 3 day UPS air service. Call us for any special order delivery instructions and a quote at 844-833-3257. Orders received between Monday and Friday are usually processed the same business day or the next day. Orders received on Saturday and Sunday are usually processed on Monday. If you or your designated recipient are not home to accept your parcel, and the UPS delivery person can not find a secure drop point for it, he or she may make up to two additional attempts to deliver your package. We are not responsible if you or your designated recipient is absent during any delivery attempts and, as a result, UPS returns the package to us as undeliverable. In such a case, an additional fee will apply to reship your package. If you choose to cancel your order after an instance of non-delivery, we will deduct the original shipping fee from your refund. A business day is a regular work day. Business days do not include weekends or statutory holidays. We happily accept returns of UNUSED AND UNDAMAGED products that can be resold. You can return any product for any reason and get a full refund only if it is received within 90 Days of your purchase date. You will be refunded for the price of the product only. We do not pay for any return shipping fees, nor do we refund the original shipping fees. Send your returned merchandise to our warehouse in Ogdensburg, NY. We do not accept any returns from UPS or FedEx unless it is prepaid by you. If you are a Canadian customer you must send your return to our Ottawa, Ontario office. The products must be received within ninety days of the PURCHASE date. We do not accept product return requests after ninety days. We issue your refund as soon as we receive the product back. Please note that your financial institution could take up to seven business days to reflect this transaction. 1. You MUST call our toll free number and obtain a Return Merchandise Authorization (RMA) number for your return. 2. You MUST include a copy of original invoice with quantity of returned items taped to the outside of the box. 3. 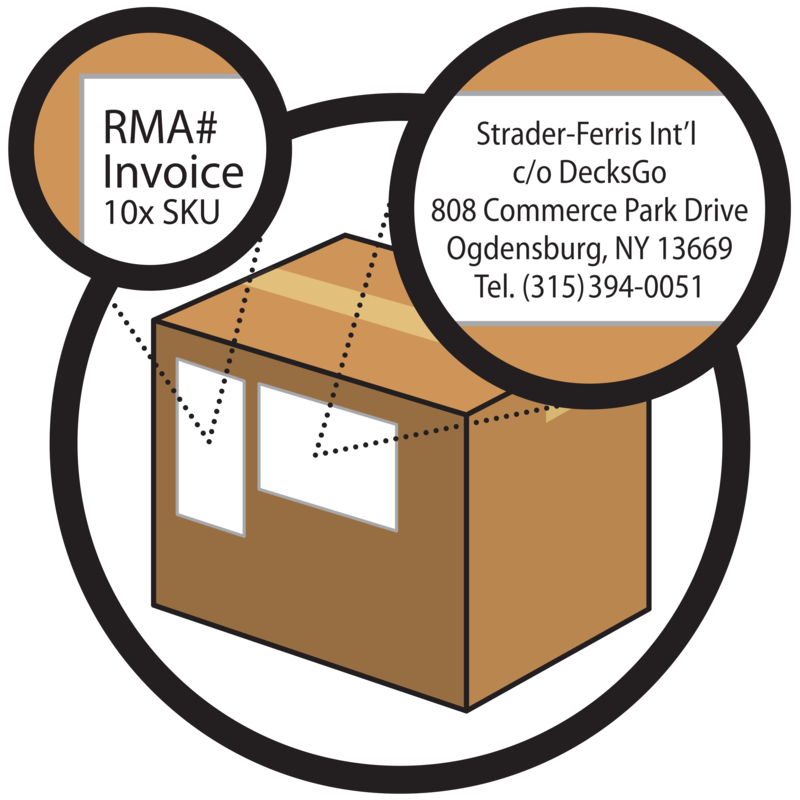 You MUST write your RMA number on the original invoice included with the package. This should also be on the outside of the box. 5. In case of multi-carton shipments, the should be clearly marked "1 of 3", "2 of 3", and so on. 6. If these steps are not followed, you will be subject to a 25% restocking fee. Contact us immediately if your order arrives damaged, or if an item does not meet your expectations. A photograph is required to prove your claim. We will, at our own expense, send out a replacement. Contact us immediately if you want to cancel an order. Our office hours are Monday to Friday from 9:00 AM and 5:00 PM Eastern Time. Please have your DecksGo.com sales receipt number on hand when you call. This will speed up the cancellation process. Although we will do our best to cancel your order at once, our ability to do so depends on when the order was placed and when you contact us to cancel it. We therefore cannot guarantee that we will be able to cancel your order before it ships. If you request a cancellation AFTER you have received the UPS tracking email and you refuse delivery when your order arrives it will be returned to us eventually by UPS. We will still refund your purchase but not the original or return shipping fees under such circumstances.